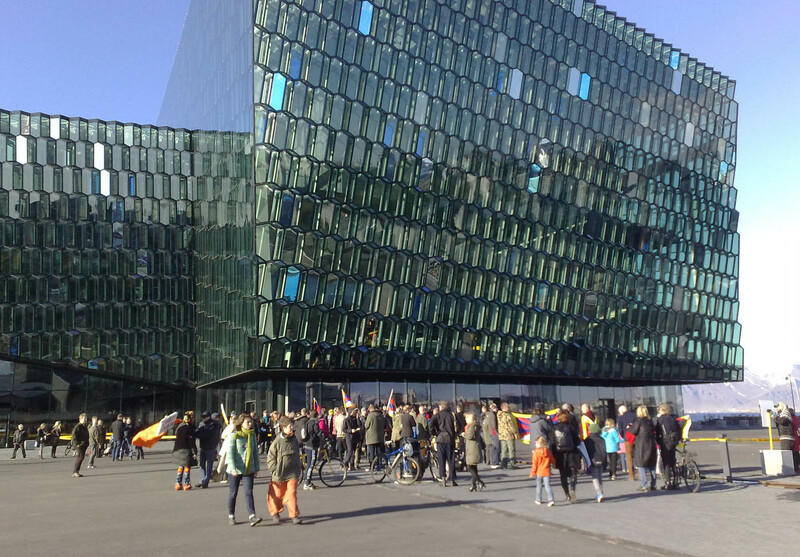 In April 2012 the Premier of the People’s Republic of China, Wen Jiabao, visited Iceland. On the first day he was driven to the Musical Hall to have a dinner. On Facebook, people were encouraged to go there and request for free Tibet. I arrived rather late, but right at time when the prime ministers arrived with a lot of security staff on cars and motorcycles. This recording was a “wind test” for my home made binaural mics with Primo EM 172 capsules. I put them in Rode WS5 foam and the result was very nice. Í april 2012 heimsótti forsætisráðherra Kína, Wen Jiabao, landið. Ekki stóð á mótmælendum til að mótmæla framferði Kínverja í Tíbet. Á fésbók var fólk hvatt til að mæta framan við Hörpu sem og nokkrir gerðu. Stuttu eftir að upptakan hefst kemur öll hersingin með mikið mótorhjólagengi í fararbroddi en skýst bakdyramegin að inngangi Hörpu. Kínverjinn þurfti því ekki að horfast í augu við hina ógnvekjandi Birgittu Jónsdóttur sem var stödd meðal mótmælenda og kallaði þar í lítið “vasa-gjallarhorn”. Upptakan er tekin með Binaural tækni og er því best að hlusta á upptökuna í góðum heyrnartólum. Í fjöruborðinu fyrir neðan Europe Villa Cortes GL hótelið á Tenerife er sjávarlaug. Sá ég fáar manneskjur synda í þessari laug. Hún leit því út fyrir að vera frekar líflaus. En þegar betur var að gáð var hún full af lífi. Í lauginni var urmull krabba, snigla og annarra kvikinda sem ég kann lítil deili á.
Síðla dags þann 22. desember 2011, rétt fyrir sólsetur, stakk ég hljóðnemum í laugina og gleymdi mér í rúman klukkutíma við að hlusta á einhver kvikindi gefa frá sér hljóð. Í bland við öldunið og fótatak fólks sem gekk um laugarbakkann mátti heyra ýmis hljóð. Öðru hvoru skvettust öldur inn í laugina en háværastir voru líklega sniglar sem nörtuðu botn og veggi laugarinnar í ætisleit. In the beach below the Hotel “Europe Villa Cortes GL” at Tenerife is a sea pool. It was probably build some years ago for people to swim, but today it is full of all kinds of algae, snails, crabs and other creatures, so it looks not popular for humans. In the afternoon at 22 of December 2011, I put hydrophone in the pool and recorded more than one hour of mystique sound. Most audible sound are rumbling sound from the surf. Sometimes the waves goes all the way in the pool with splashing sound and sometimes footsteps can be heard when people walk by the pool side. 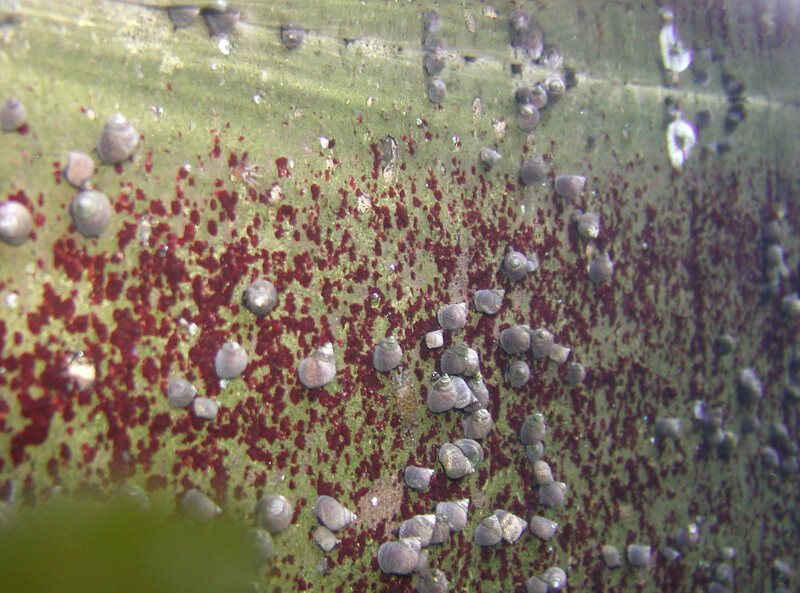 But there is also many other sounds from organic creatures, most likely from hungry snails scratching the pool surface.